Patsy Walker-Pointer is at the far right in lane one in the picture above finishing ahead of Olympic Champion Jackie Joyner-Kersee. Patsy was running for Team Adidas in this picture. As many of you know, I am writing the history of running and Track and Field in Thurston County (located in the State of Washington). 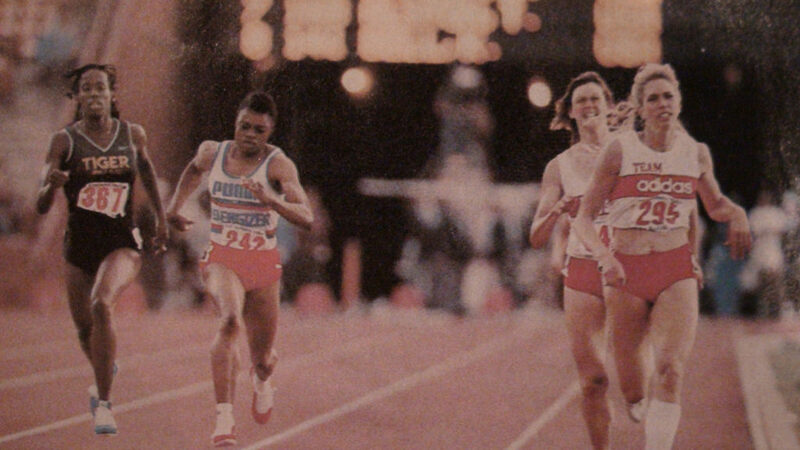 My pick for the greatest female track athlete in Thurston County history is Patsy Walker (Pointer now). Patsy singlehandedly won the state 1-A track championships for Yelm High School in 1977 by winning four events! Patsy is one of the few athletes in history to win a team state championship all by herself. Patsy was recently inducted into the Washington State High School Hall of Fame for her many accomplishments. Patsy finished ahead of some of the best athletes in the world during her incredible Heptathlon career. For example, Patsy finished ahead of Olympic Gold medal winner and world record holder Jackie Joyner (Kersee) at the 1981 Collegiate Nationals. In addition, Patsy was on the world track and field team and served as the Olympic team alternate in the heptathlon. Patsy was a teammate and friend of mine on the old Thurston County Striders Track and Field Club. The Thurston County Striders was an incredible track and field club in the 1970's that was led by Hall of Fame coach Dennis McDonald. The club was based in Lacey, Washington. I was blessed to know Patsy and to see her development from a local hero to a world class athlete. We trained together for many years during the summer months as part of the old Thurston County Striders track and field team. We also attended the 1975 National Junior Olympic Championships together in Ithaca, New York during our high school days. Patsy was also incredible in the classroom. She was super smart academically. Patsy is much more than a star track and field athlete. Her accomplishments still inspire young runners in our area this day. I will never forget this incredible athlete and even better person. Patsy Walker-Pointer is truly the best female track and field athlete in Thurston County history. The picture below was taken in 1975 when Patsy and I were at the National Junior Olympic Championships in Ithaca, New York during our high school years. Back in the day, I ran 1:51.7 for 800 meters (1:52.3 for 880 yards) and finished second in the national Junior Olympics in Ithaca, New York beaten only by a national record at the time. I was 17 years old. 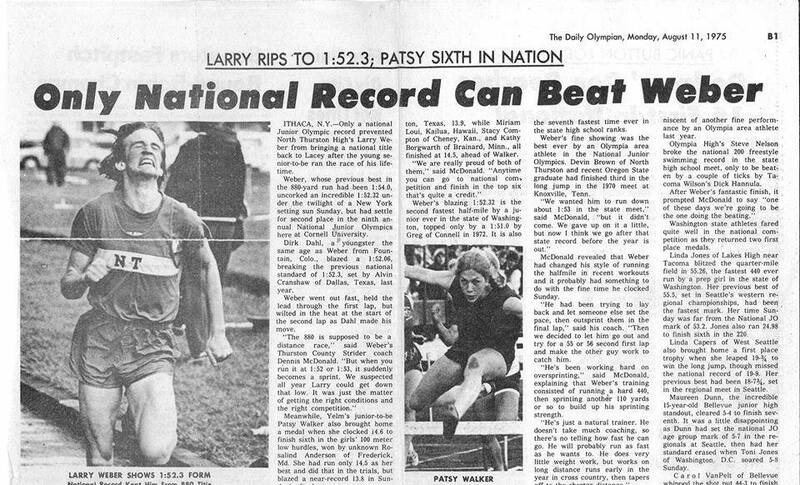 Patsy was sixth in the nation in the hurdles at the same meet in New York and was 16 years old in the picture.